The entire first year of the best-selling Werewolf High series is now available in one collection! Join Lucy and the pack in the first three books, as they face down all the dangers that come along with werewolves, witches and high school! 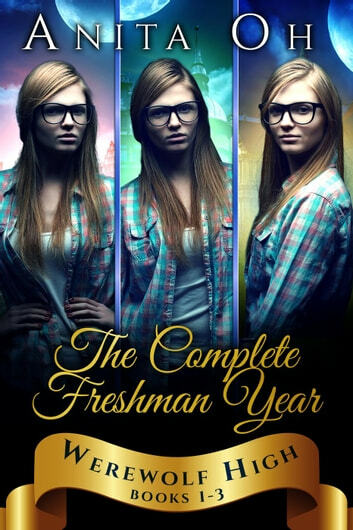 Lucy O'Connor is more IT girl than "it girl" but even though she'll never fit in, the scholarship to elite Amaris High is an opportunity she can't refuse. The day Lucy arrives at Amaris, she sees her best friend, Sam Spencer. But Sam had died three years ago, on the night that had changed Lucy's life forever. The more Lucy looks for answers, the worse things get for her, as she makes an enemy of the richest, most popular boy in school, Tennyson Wilde. When the entire school is hit by a truth spell, it seems like the perfect chance to find out what Sam and Tennyson are hiding, but the closer Lucy gets, the more she realizes that the truth is stranger than she ever imagined. Life isn't going so well for Lucy at elite boarding school, Amaris High. Classes are a struggle. She has no leads on the evil magic user. Sam's avoiding her, and the entire student population hates her. But someone hates her more than the rest. Rumors start spreading that lead to Lucy being bullied worse than ever before. Just when she thinks she couldn't feel smaller, she's hit with a spell that shrinks her down to only two inches tall. Forced to rely on Sam, Tennyson and the other Golden to survive, Lucy is determined to get to the bottom of things once and for all. But the more she learns, she finds that being tiny might not be her biggest problem. Lucy's world is turned upside down when she learns that her enemy is the one person she never suspected. Although she has Sam and the Golden on her side, she no longer knows who to trust. Then, when she's hit with one final spell, she has no choice but to put her faith in the person the she despises the most. Stuck in Tennyson Wilde's body, Lucy and Tennyson must work together to break the curse or risk becoming each other for real. But in order to fix things, Lucy will face the greatest betrayal of all. The Curse: The Butterfly Effect, Book 2. Enjoyed this series so far. Looking forward to Sophomore year! Quite an amusing series. Kept me turning the pages until all 3 books were done and now I am going to get the next ones. I really enjoyed these books. It's better to get them as a year set and not individually. The characters sense of humour was really enjoyable. She is feisty and sarcastic. This girl takes quite a bit of hardship and just keeps on going. I love her will to do what needs done no matter what stands in her way. This boxset has three imaginative tales set in a high school full of magic and mischief. I don't read many teen/young adult books and was pleasantly surprised at how quickly I was pulled into Lucy's adventures at Amaris High. Each book finds Lucy in a new mess of trouble and takes her on quite the adventure. Reminiscent of the Harry Potter series, the stories are fast-paced and fun, the characters are interesting, and the dialogue and situations are witty and often hilarious, and the world-building is fantastic. Much like any high school, friends can become enemies and vice versa with bullies, cliques, and the rumor mill. It's a world of teenage angst (but not too much) mixed with magic and werewolves.